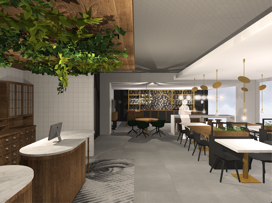 ADAGIO TO OPEN ITS FIRST APARTHOTEL IN AMSTERDAM! Aparthotels Adagio, the European leader in aparthotels has announced the opening of its first property in Amsterdam. Opening on 05 June 2018, Adagio Amsterdam City South is located between the Dutch ‘Polder’ landscape and the business district of both Amsterdam South and Amstelveen and within 20 minutes of central Amsterdam. A new look property from top to bottom, the aparthotel boasts 151 apartment of the brand’s innovative new apartments – all designed to promote a more dynamic living space. Adagio Amsterdam City South also features the brands revolutionary new ‘Circle’ concept for its public areas. At the heart of this design revolution, common spaces have been completely rethought, adding functionalities such as a shop, an objects library and an entertainment corner, with the objective being to revitalise the customer experience. The aparthotel has a prime location, with great connections to the Zuidas Business District, Rai Convention Centre, VUmc and the city centre of Amsterdam. It is located in walking distance of a metro station and also offers private parking for guests. The property offers modern and air conditioned studios and apartments, 24 hour reception and free WIFI in all areas. All studios and apartments come with a smart TV and a fully equipped kitchen with a stove, microwave, fridge and dishwasher. “The new property in Amsterdam is underlining the focus we have to grow outside of France. It is an exciting development for the brand in Benelux and a key new opening as part of our European expansion plan. Denys Sappey, COO of AccorHotels BeNeLux said: “I am very happy to inaugurate, together with our partner the Borealis Hotel Group, the opening of Adagio Amsterdam City South. “Together with experienced long stay operator Adagio we are entering into a new segment in the Amsterdam market, a market in which Borealis is a leader in with years of knowledge and experience.